Corn flour is used frequently to make dinner rolls, but I wanted to develop a set of recipes using corn flour in dessert cake. On this page I'm showing my basic corn dessert cake. This cake is the foundation for a series of variations, including the New World Spice Variation and the Lemon Variation. Generously spray two 9x3" cake pans, set aside. Preheat your oven to 350 degrees Fahrenheit. In the bowl of your stand mixer, using the paddle attachment, combine the corn flour, all-purpose flour, cornstarch, baking powder, baking soda and corn oil. Turn the mixer to its lowest setting and mix just until the dry ingredients are coated with the oil. Scrape the bottom of the bowl to be sure all of the dry ingredients are coated. In another bowl, add the buttermilk, vanilla, eggs and salt. Stir until the salt is dissolved. Add these wet ingredients to the mixer's bowl. Add the sugar to the mixer's bowl. Turn the mixer to its lowest setting and combine the ingredients. Once fully incorporated, turn the mixer to medium speed and allow the batter to beat for two minutes. Divide the batter evenly between the cake pans. Bake for approximately 31-33 minutes, or until a toothpick inserted in the center of the cake comes out clean. Transfer to a cooling rack and allow the cake to sit in the pans for 10 minutes. Remove from the pans and cool completely on a rack. Pour the corn flakes into a large bowl and pour the melted butter, in thirds, over the flakes, turning them after each addition to coat. Continue mixing until all of the flakes are coated. Sprinkle the sugar over the flakes, a bit at a time, turning after each addition to coat the flakes completely. 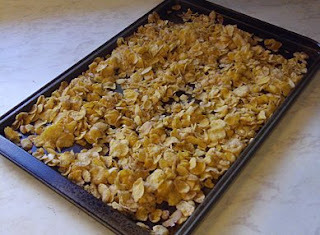 Divide the flakes between 2 cookie sheets. Spread evenly and bake for 3 minutes. Remove the pans and turn the flakes. Bake for approximately another 3 minutes, until the flakes are crispy and golden. Cool the flakes in the trays on a cooling rack. Add the cream cheese, butter, almond extract, maple syrup and sugar to a bowl and beat until fully combined. If the frosting is too thick, add a few drops of milk, if it is too loose, add spoonfuls of powdered sugar until the frosting is of spreadable consistency. When the cake and corn flakes are at room temperature, frost the cake with the cream cheese icing, then pat the corn flakes on the sides and top of the cake to finish. You should have some extra flakes when finished.